Flipkart Big Billion Days Sale has begun for all customers. The Big Billion Days Cell for Flipkart Plus Members was started on Tuesday night. On the first day of sale, offers on TV, speaker, wearable and other categories of products. Flipkart Plus members will be able to access deals from 9 pm on smartphone and other electronic products, offers for other customers will be available from midnight. Flipkart has joined hands with HDFC Bank for the convenience of customers. If you pay the bill with the HDFC Bank Card on the purchase of minimum Rs 1,499 then an instant discount of up to 10% (up to Rs 2,500) will be given. 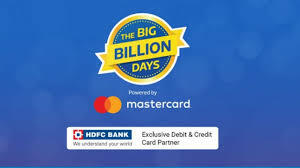 During Flipkart Big Billion Days, you will receive an exchange offer, cash back to the phone pay user and an EMI without any interest. We are going to tell our readers about the best deals on the first day of sale. Google Chromecast 2The cost of Google Chromecast 2 is Rs 3,399, but during the sale, this device is available for Rs 1,999 after a discount. Chromecast 2 is installed in the HDMI port of the TV. With this device, you can see the things on mobile or computer on TV. It is capable to work with Android, iOS, Mac and Windows devices. Sony 4K Smart LED TVsSony 43 inch 4K smart LED TV is being given a discount of Rs 37,901. After discounts, the TV is available for sale at Rs 54,999. Under the exchange offer, the maximum discount amount is Rs 8,000. An additional 10 percent instant discount on payment from HDFC Bank Card will be available. This Sony TV comes with four HDMI ports and three USB ports. If the customer wants, then by paying an amount of Rs 4,599, the warranty can increase for two years. Let me tell you that the MRP of the Sony TV is Rs. 82,900. JBL Cinema SB 150 SoundbarWith a discount of Rs 15,491 on the JBL Cinema SB150 soundbar, it is getting 9,499 rupees. The MRP of the soundbar is Rs 24,990. JBL Soundbar comes with the wireless subwoofer and Bluetooth support. With the help of Bluetooth, you can enjoy music by connecting the device to the mobile. Blaupunkt TS-100 Tower SpeakersAfter discount on Blaupunkt TS-100 200 Watt Tower speakers, the speaker is being sold for Rs 9,999 (MRP 22,990). The speaker comes with the touch panel. You can also connect these speakers to the TV. Apple Watch Series 3 42mmIf you do not want to spend much money to buy Apple Watch Series 4, a discount of Rs 10,510 is being given on Apple Watch Series 3. During the Flipkart Big Billion Days Sale, Apple Watch is being sold for Rs 23,900 (MRP 34,410). Apple Watch series comes with 3 GPS support. It tracks all your activity and alerts you to notifications coming on the smartphone. Vu 55 Inch 4K Smart LED TVsThis TV is being sold for Rs. 43,999 after a discount of 22,001 rupees on VU 55 inch 4K Smart LED TV. Please tell that the MRP of this TV is Rs 66,00. Under the exchange offer, an additional discount of 15,000 rupees will be available. Now talk of connectivity. In this TV of Vu, you will find three HDMI port and two USB ports.